I wrote a post similar to this almost a year ago (it's called the "Bright Eyed, Bushy Tailed Edit" if you want to go have a laugh), but since posting that one my work schedule has been changed again and I have to get up even earlier every day. The early and cold mornings have been doing no good for my complexion, so I need to pull together a few natural glow-inducing products to keep me from looking like an extra from The Walking Dead. When I wake up looking particularly dull and gray, I reach for the REN Flash Rinse 1-Minute Facial right away. It's so effective and really only takes one minute, so it's perfect for mornings when you may be a little rushed. It's a fast-acting exfoliant that uses water-activated Vitamin C to slough away that layer of dead skin. The instant results are truly remarkable - brighter, glowing skin as soon as you wash it away. Once I've got the dead layer off, I like to continue with the rest of my skincare routine. The best brand for a nice, dewy complexion is Glossier - I'd recommend their whole Phase 1 Set, but the most important product here is the Priming Moisturizer. This is seriously some kind of magic - it instantly plumps the skin and eliminates a lot of redness. It's my first choice for moisturizer if my skin is feeling especially tired and lackluster. Another great option, or maybe one to mix with the Glossier moisturizer, is the MAC Strobe Cream (which I've forgotten to include in the picture!). It really amps up the glow in your skin without looking shimmery or too shiny. Both products just give the skin a really healthy looking sheen, like you're perfectly hydrated and rested. I don't always reach for eye cream in the mornings, but if I'm looking particularly zombie-like I'll reach for the Origins GinZing Refreshing Eye Cream. It's a salmon pink-toned cream so it helps to counteract the blue tones in the dark circles, and it has a bit of luminescence in it as well to really brighten the area. The Priming Moisturizer really makes it possible for me to only wear a light base as it eliminates so much redness for me. Glossier's Perfecting Skin Tint is a favorite, but any glowy and light base will do. My other favorites are the bareMinerals Complexion Rescue Tinted Hydrating Gel Cream and the NARS Pure Radiant Tinted Moisturizer. Despite being super lightweight, they both give a good amount of coverage (the NARS has slightly more). Like the moisturizers mentioned, they also leave the skin with a nice sheen that doesn't look or feel greasy, and the NARS Tinted Moisturizer especially has great lasting power. Going back to those undereyes, if I'm wanting to look really awake I'll always reach for the Estee Lauder Double Wear Brush-On Glow BB Highlighter. It's similar to the YSL Touche Eclat, but it actually has excellent coverage. I have the lightest shade (0N), and it's quite brightening even on my super pale skin. It covers up the rest of the dark circles that the eye cream didn't take care of and brings a lot of light to my undereyes. I wear highlighter everyday, but when I wake up feeling extra tired and dull I'll always reach for a cream over a powder. They're usually not as intense, but they really help in adding a healthy glow back to the skin. My favorites are the rms beauty Living Luminizer and the Clinique Chubby Stick Sculpting Highlight. The Living Luminizer is just amazing and is definitely the one to go for if you're looking for a healthy glow. It gives the most beautiful and natural looking sheen to the skin, and it lasts a really long time. The Clinique one is a little more intense but still lovely. I love that it has more of a pink tone to it - as my skin is quite pink-toned, it looks believable as a real dewy glow. I've finally gotten into the habit of setting my makeup - I used to never do it because I didn't want to cake powder onto my already dehydrated face, but not doing so was ensuring my skin would drink up all my makeup within a couple hours. 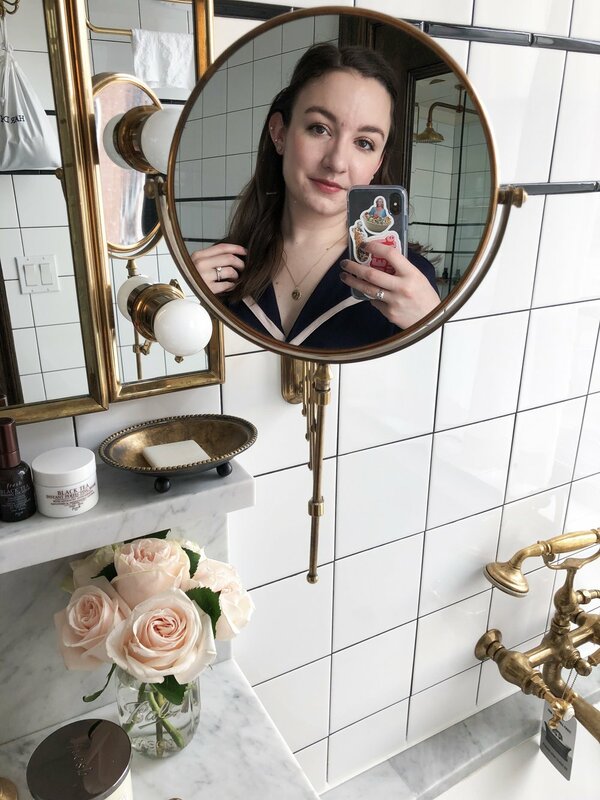 Now I always finish every look with a dusting of the Hourglass Ambient Lighting Powder in Diffused Light on my face, concentrating on my T-zone and chin. It's the perfect powder to use in a healthy, glowing look like this because it doesn't dull down the luminosity you've spent so much time building up. This powder is just gorgeous and deserves all the hype - it's so soft and doesn't look shimmery or glittery on the skin (or even in a swatch). I love the Diffused Light shade as well, because as it's a pale yellow color, it's excellent at hiding any redness that may start to pop back up throughout the day. What are your go-to products when you're feeling tired and lackluster?